Corby Town have signed former Boston United midfielder Ryan Semple. 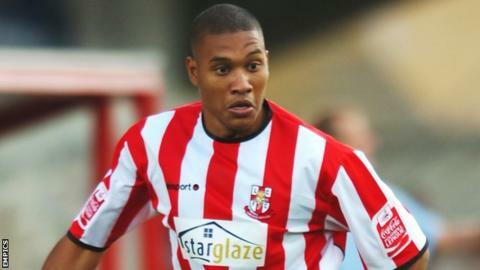 The 26-year-old also counts Lincoln City, Peterborough and Rushden & Diamonds amongst his former clubs. Steelmen manager Ian Sampson told BBC Northampton: "He's an exciting winger, can play both sides, go past people and delivers good balls in the box. "He had a fantastic reputation at Peterborough and went to Manchester United for six weeks. You don't go to places like that [without] ability." Semple helped Boston to Northern Premier promotion in 2009-10 and then to the Blue Square Bet North play-offs in 2010-11. He was released by the Pilgrims in late April 2012, and becomes the third new player for the Steelmen after Paul Walker and Lewis Webb. Semple used his Twitter account to announce the move, stating that "the chance to work with both Ian Sampson and Chris Plummer was too good to turn down." "It's a nice compliment for myself and Chris," said Sampson. "We're hoping we can have an influence on one or two other signings with what we've done as players and managers in the past. Hopefully what he said will rub off on a few others."